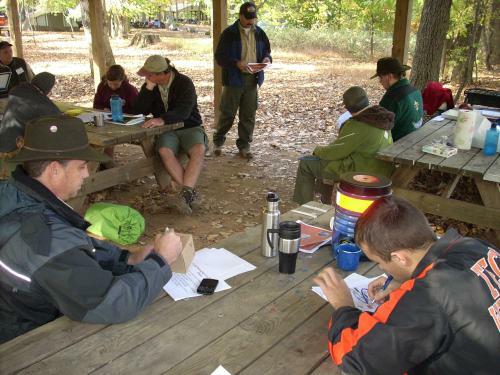 This past weekend, I took a Leave No Trace "Trainer" course, offered by the Baltimore Area Council, Boy Scouts of America. In some ways, it was "just another weekend in the woods." In other ways, it was more an eye opener than many camping and/or training events. I'll summarize only a few of the lessons imparted/shared this weekend, using the 7 principles of LNT, more or less, as headlines. We as students had prep work to do. Some of us realized that earlier than others; I read the email in detail a few days ahead and had time to print up lesson papers, hunt down drawing utensils (crayons), and think through the teaching process. There were more students than I expected (like, twice as many), so I had them use the buddy system. I also printed on two-sided sheets, which I guess I didn't explain. The wrap up wasn't sensational, though I think with the hands-on activity the class was more engaged and interested than if I had lectured for 10-15 minutes. 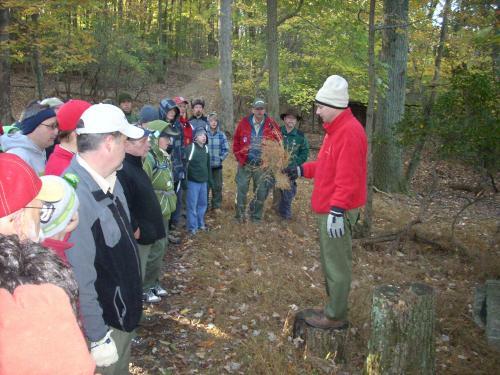 Below is a shot of Tom Willis, the main instructor, handing over the group to Tony and Al for their segment. As you can tell by the projection screen, hanging materials, course paperwork, DVD, candy, and etc. etc. that you can't see (food, training books, props, flotsam, jetsam, stoves, fuel, more food, more papers) Tom and the other instructors planned a lot more than we did. As mentioned above, the second part (camping) was my topic. We camped in 2 areas - front country and back country, though they were literally separated by mere footsteps. 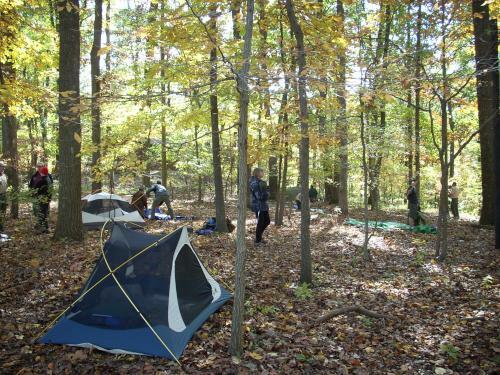 Below is a shot as we set tents up in the "pristine" area. 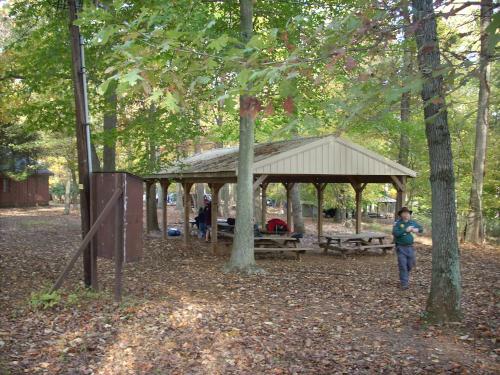 The phrase Tom used for the active compaction process was "sacrificial sites", those areas closest to the roads and parking lots to attract the majority of visitors. Large parts of Broad Creek are closed to camping, off-limits for fires, and only accessible after serious hiking. But the most public areas are the most impacted. We had several different views of waste, including minimization, best practices for disposal, and reviews of animal behavior impacts. This shot demonstrates a lower impact clean-up process than the traditional 3 tub method (wash, rinse, sanitize). It's more like a 1-and-a-half tub method, as only 1 tub gets dirty water in it. The one on the right is supposed to be hot (nearly boiling) water, and is used as a source for the rinse, done by pouring our of the small cup. Don Martin set this up for us (I think), and he had to instruct some of us more thoroughly than others not to dip dirty dishes in the rinse. We're so used to the "dip, dip, dip" process that this takes a little thinking. Cutting down on the dirty water (also by not dipping plates with food particles still on them) reduces the generated waste and thus the impact of broadcasting that gray water over the ground when the cleaning is done. Or is it ever? This one is hard to illustrate, but there's a simulated artifact (cubical cardboard box) circulating through the class, picking up graffiti on the way. Chris, the segment instructor, took a "before" photo so we could appreciate how the relic was degraded by overuse. Very effective. We walked on the road for most of this hike, but did go through a campsite to assess its impact. Fire damage - see below. To the right of the picture below, with the bright reflective strips flashing back the camera strobe, is one type of bear bag (cylinder in this case). Again, hard to illustrate in a photo, plus I missed shooting a video of the rope throw attempts over the rafters. Very sharp eyes will note the official Leave No Trace stainless steel water bottle. I have one just like it, but that one is not mine. I carried the old, Nalgene, deprecated plastic bad material, with all of the seven principles rubbed off. And my old school Sierra cup, plus my newish spork, with the broken-off caribiner. It might be tricky to spot in this small image, but through the right side of our pavilion you can just see the next pavilion. We're so close that we might have been able to hear our respective snoring, if ours wasn't overpowering loud. The neighboring group had a largish campfire, brought plenty of vehicles right up to their tent sites (road or no road), yet were otherwise well-behaved. We probably should have asked them what they thought about our group. 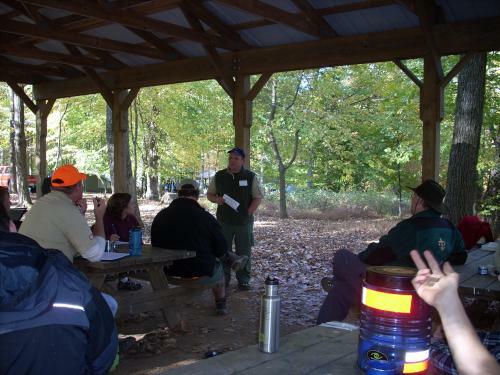 I brought a clipped image of the Susquehanna site to the LNT course, showing it to my fellow students when we talked about campfire impacts. Of the many fire rings at Broad Creek, that one probably shows up the clearest from satellite photos as it is in a large open grassy area, while others may be closer to trees that diminish their contrast. As you look at the images below, visualize the tendency of a large circle to motivate Scouts to build large fires, sitting farther away from each other, and creating more and more ash. 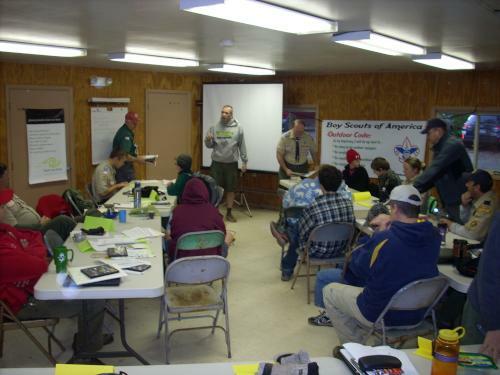 Service projects to reduce the size of the fire rings, cutting down on multiple rings in the same camp site (note the 3 or 4 visible in the Camp Spencer view), and shrink the amount of wood consumed are noble goals. Will Scouts respond? Perhaps more likely if they see these are discernible from miles away, in space! But don't forget the food! 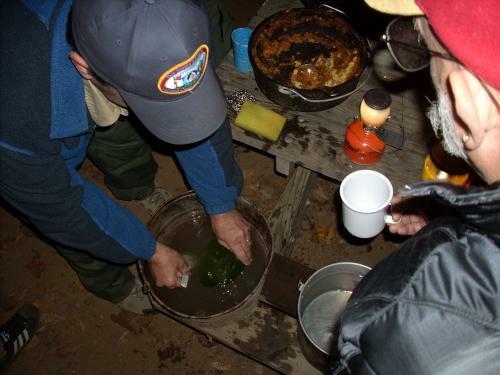 We used several LNT methods for food preparation, including camp stoves, pan fires for minimal impact, and as few pots as possible. The menus were awesome, the portions satisfying, and we still squeezed in a Saturday night cracker barrel with actual crackers. Not sure about the barrels, unless the bear vaults qualify. Tilman and his father sat next to the SAP Community Clue Train contingent, between Frankfurt and Berlin, on 09-Oct-2010. We six, or seven, or eight bloggers, mentors, and SAP code exchange stalwarts enjoyed ourselves with Mark Finnern's homemade Linzer Torte. Craig Cmehil shared his "big boy" toys with young Tilman, letting him watch movies on the iPad and Touch to while away the hours on the train ride. I think the earphones also permitted us to share state secrets without the chance of Tilman overhearing. I had asked my fellow riders for a quote about the trip; near the end our young friend pronounced this his "best trip ever!" I've used American vernacular for this post title, which I'm unsure how to translate into German (Deutsch) idiom. Perhaps a community member will fill me in? Saturday October 2nd turned out to be a stupendous day, a complete weather reversal from the tropical storm remnants nor'easter that came through the area Thursday. Thousands of Scouts, Scouters and the general public came to Fort McHenry, the National Monument in Baltimore, for the Star Spangled Camporee. Some units got to camp inside the fort itself. 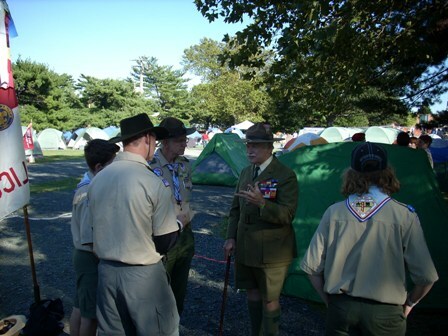 Pictured here is a visit by Lord Baden-Powell, founder of the world Scouting movement, within the camping grounds. I'm only sorry more Scouts could not have experienced this!